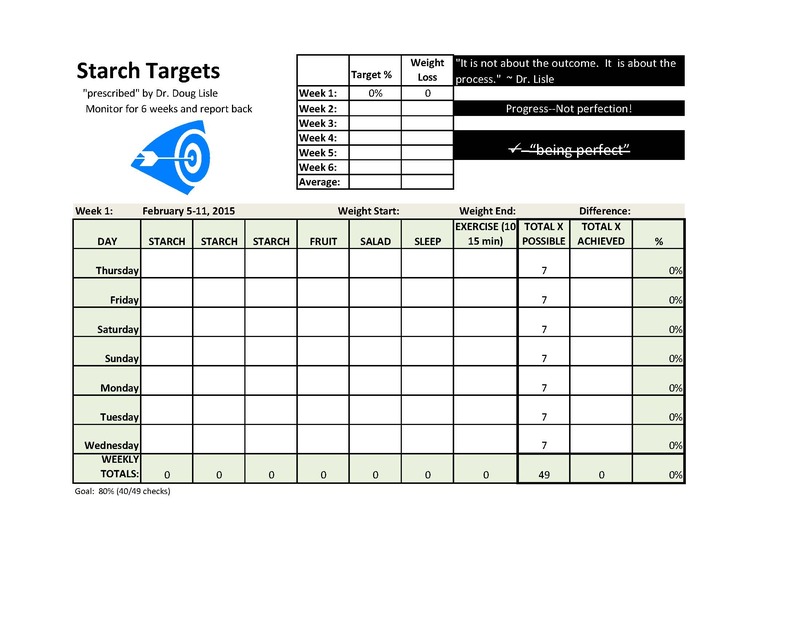 My Starch Targets Tracker | Finding My Inner Athlete! I’ve been struggling a bit to keep things moving along like I want them to. One of the things I mentioned earlier is my visit with Dr. Lisle while I was at True North. I was going through the paperwork that I brought home with me and I found the notes he wrote out for me from our session. My question had been, “What strategies might I employ as one who has the complete opposite of the perfect personality (I had just watched his lecture about the perfect personality for sticking to this plan) for this plan in order to be successful.” I also mentioned that I tend to have an all-or-nothing response to things like this. He quickly grabbed a sheet of paper and drew out a tracking system for me that might work–stressing that it is not about checking off a box that says I’m doing it perfectly. What I’m aiming for is 80% (40/49ish checks per week) while tracking the following criteria: 3 starches per day, 1 salad, 1 fruit, 10-15 minutes of exercise, and adequate sleep. I was supposed to do this and then get back to him after 6 weeks. Well–time has obviously gotten away from me, so I am starting now. Being the geek that I am, I have developed an extensive Excel worksheet for tracking. Here is a picture of what week one looks like. It is my plan to post an update weekly and then follow-through with an e-mail to Dr. Lisle after week 6. Hopefully I will average at least 80% and have shown a weight loss of 1-3 pounds per week. How do you measure your success? Do you have some sort of a tracking plan? Do you tick of a number of steps per day or a number of visits to the gym? Do you count calories? I’m interested in hearing what kind of strategies are motivating and helpful to others–whether it be regarding eating, exercise, or developing any new habit. I found that if I was having vowel movements (compared to my previous constipated state) then I was losing weight. Now it’s maintaining. I love this! I am always wondering how you are doing. How much weight have you lost? How is the plants thing going? Keep posting please. I want to hear more of your journey.